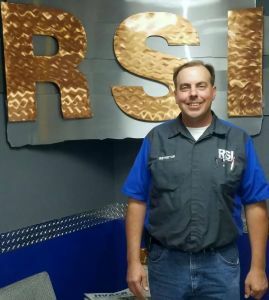 Michael, 40, born and raised in Seattle, is an Instructor at The Refrigeration School (RSI) in Phoenix. He teaches Phase 5, the Fundamentals of Refrigeration. Michael has been in the HVAC field for 19 years and joined RSI in December 2016. Thanks for your time, Michael; what did you want to be when you were a kid? I’ve been working on equipment since I was five. My grandfather was a farmer. He’d had a farm his whole life, so he’s always had equipment that he worked on. So, I’ve been working on diesel engines and automobiles, stuff like that, since I was a kid. When I was 18 I wanted to be a first grade teacher. In my senior year of high school, I was a teacher’s aide for my first grade teacher. She let me teach class when I was there, and it was really fun. I loved how when you taught the kids something, when they got it, their eyes lit up! So that’s what I wanted to do, but then a friend of mine talked me into going into HVAC instead, frankly because the pay was better! This was up in Seattle, Washington? Yes, this was the mid-90s. I went to HVAC school from 7.30am to 2pm and worked in a hotel from 3pm to midnight seven days a week. So I understand what our students go through when they’re juggling family, school and work. Even though I’m not married and don’t have kids, I remember how tough it was. Once I graduated I went to work doing commercial heating and cooling. After my school/work schedule, it was actually kind of nice to only work 10 hours a day! I had all this free time, and I was very lucky that I had some very good journeymen who helped shape me to be the way I am today. In December 2005 I moved to Arizona and I got into residential and have loved it ever since. Is RSI your first teaching job? Yes and no. A company I worked with down here in the valley and up in Prescott would hire apprentices – people who knew nothing – and I would train them. So, I’ve taught quite a few apprentices who didn’t know anything, but as far as a first full-time teaching job, this is it. Teaching is very rewarding, and I’d been seriously thinking about it for the last couple of years. Not to be cocky, but I thought I’m very good at what I do – both mechanically and with customer service. But I was only impacting one or two people at a time. I thought if I went into teaching and taught a class of people what I knew, both mechanically and about customer service, then maybe I could make thousands really good at the job rather than just a few. Once I made the decision, I worked hard the last few years as a service manager so that I’d be able to move down here from Prescott and become a teacher. What made you choose RSI? It was the national reputation of the school, and the quality of graduates I’d see coming out into the field in comparison to people from other colleges. Up in Prescott we didn’t have a great pool of service people, so I proposed that we hire guys right out of school. I actually interviewed six RSI graduates. I noticed that each of them knew what they were doing; they had a very good, strong knowledge base as far as electrical and refrigeration. They also had good customer service skills, which isn’t something the school focuses on, although I do. As an employer that strong foundation is half the battle because the customer service I could teach. They were very confident – not cocky – and had good personalities. We ended up hiring two of them. It’s still the same as with the first graders! When their eyes light up when they get something. The difference is that our students, being a little older than first graders, really don’t like to admit when they’re having a hard time with something. So the trick is to figure everybody out so you can give people the attention they need to be able to keep up. Sometimes you may have to apply something six different ways for everybody to get something, but in the end they get it, and that’s very rewarding. I tell them to just keep doing things the same way and eventually the light bulb will come on! Can you see yourself teaching until retirement? For sure. I want to teach people what I know and what I’ve learned, including different ways of dealing with people in a positive way instead of a negative way. My goal is train 15,000 students in my career. The way the school takes care of us and keeps us happy; they have a very good open door policy. There’s no reason to leave. I look forward to going to work every day because of the people I work with. It’s an awesome team and a wonderful place to work. Everybody really cares about what they do. They always have good advice, and they are passionate about our students’ success. I feel very honored to work for the best HVAC school in the nation. There really isn’t anything. I’m probably the biggest nerd you’ll ever meet. I never got in trouble. I’ve never been to jail although I did get one speeding ticket when I was 18! I’m probably the biggest dork you’ll ever meet! But I will say that my family means everything to me which is another reason I moved down here from Prescott, as my parents are getting older and my brother and his wife live in Gilbert. So if there’s anything it’s that my family means the most to me in every way. It sounds dorky, but I’d stay at RSI because helping people is what I like doing, so I’d still teach. That doesn’t mean I wouldn’t take a month off once in a while to see the world! The President of the United States…because he came from nothing and made himself into something. Stick with it, don’t quit, because there will be times that you want to. There will be tough times. Whether it’s a family emergency or something else that’s making life harder but stick with it. Once you get your experience, you can write your own ticket in this field. Once you get out there, don’t be all about the money. Money is important for sure, but don’t be all about the money. Loyalty is a big thing too because the money will follow. But stick with it – the first year out of school is always the toughest. What’s the most important tool in the HVAC field? Your mouth. It can get you into, or out of, trouble. I wrote a 300 question test that new applicants had to take when I was a service manager, and that was one of my questions. It’s the most important tool in the customer service industry and/or HVAC. Think about it this way. I could go to a customer and say, “I don’t know what the problems is. You’re messed up…” or I could say, “I want to run something by my tech guy real quick because I’m 98% sure what’s wrong, but I just want to be 100% because it may be a little bit of a costly repair. Before I jump into it, I want to make sure I’m on the right page.” As a customer, what would you rather hear? That’s why your mouth is your most important tool. Thinking of your time in the field; what was your favorite part of the job? It was residential and commercial heating and cooling service. So fixing the stuff or doing tune-ups because I love dealing with people, and I love fixing things! Straight up I’d probably take my brother out to lunch to spend time with him and his wife. He lives down in Gilbert and my parents live over in Sun City West, and that is a distance. My electrical teacher back in Seattle – Ric Deputy. I failed the first two electrical tests, and he pulled me aside and said, “I don’t know why you’re really here.” He was actually kind of gruff, but he worked with me for three or four days until I could understand what was going on, and my grades shot up. He believed in me; he never gave up on me. He passed away about 13 years ago unfortunately, but he’s why I’ll never give up on any of my students, no matter what.